No one keeps the Clan Gunn motto closer to his heart than its war chief, Jamie Gunn. Willing to keep the tenuous peace between clans by any means necessary, he would lay down his life for his family. So when word arrives that his aunt Ailis has been kidnapped for hiding a woman in her abbey, he takes to his steed at once. Lady Gilliane de Verrill came to the abbey seeking refuge from Guy de Orbrec, the cruel Norman despot who stole her hand in marriage on her father’s deathbed. 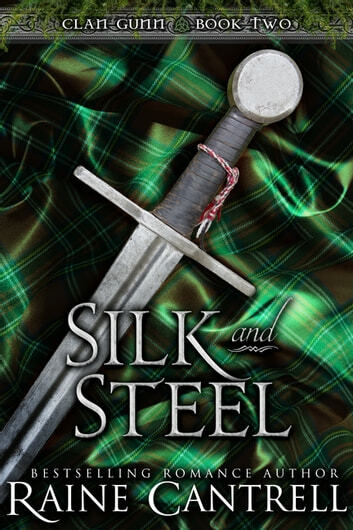 When her only source of protection turns away Orbrec’s men and is kidnapped, Lady Gilliane knows there is only one thing she can do. Bearing responsibility for Ailis’ life on her shoulders, she rides off to seek help, with Orbrec’s men hot on her heels. When the two meet by chance in the woods, they encounter in each others eyes more danger than even Guy de Orbrec could provide. Will Jamie, struck by the beauty and kindness of this mysterious woman responsible for his aunt’s disappearance, risk his all for someone he barely knows? Can Lady Gilliane, taken by this hero seemingly lifted directly from her father’s fairy tales, look past his wild nature to the gentle man within? With a life on the line and Gilliane’s freedom at stake, their blossoming love could be their very destruction.